Fine Mess Pottery: My Students are Awesome! Have I mentioned that I love my students? Not only are they up for any class project or game I throw at them, they make up their own challenges! 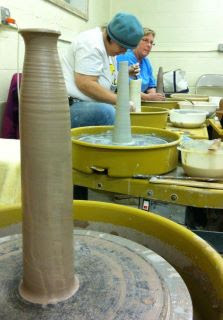 This group, Portland Pottery's Tuesday night class, chose to challenge each other to make the tallest thing they could out of three pounds of clay. These are all in the neighborhood of 12 - 13 inches. Want to be a virtual part of Tuesday Night Awesomeness? If there are clay students out there reading this, sing along with Mitch! How tall can you throw three pounds?